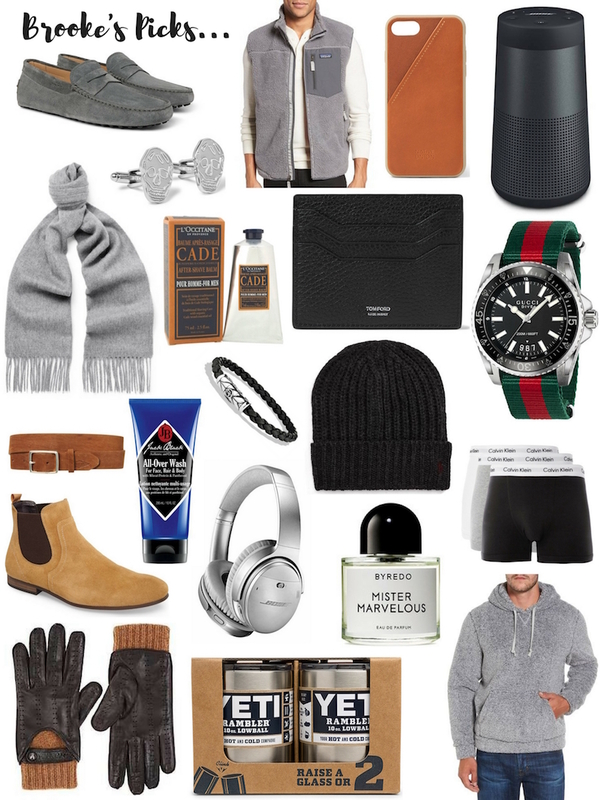 When it comes to putting our gift guide ‘for him’ together, we always make our hubbies help us! They have great style & know what the guys want this year. 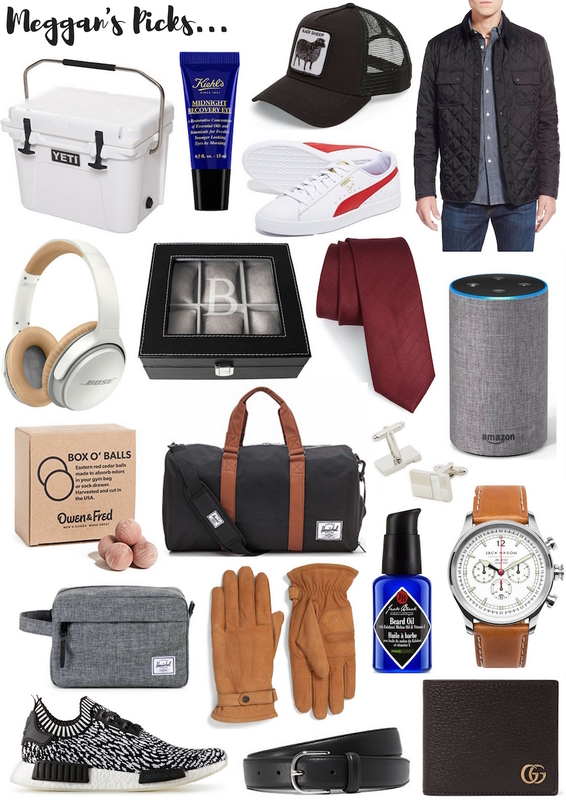 It’s so hard to shop for guys, and honestly we never know if they’re going to like what we buy lol, so we figured their picks are better than anything we could come up with on our own ;). Grey Loafers – Chad has these in navy and wears them all the time, I love the grey. And these shoes look good with everything! A step up from an everyday sneaker (and he says they’re his most comfortable shoe). A splurge for a shoe, but that’s why they make a great gift! Patagonia Vest – I love giving anything Patagonia to men as gifts. I’ve given my dad several jackets and vests, and they’re just a great staple piece for a guy’s closet. I love this vest because it’s refined but still warm! Leather Phone Case – This phone case is good looking, but it also has a space for credit cards/train pass/IDs, etc which is why it’s great for guys (who are always losing everything!). Bose Speaker – I swear this speaker is probably at the top of every guy’s list this year! Bose makes great products (the best! ), and this speaker has amazing reviews. It has bluetooth and you can take/make calls through it! Scarf – A (nice) scarf should be a staple in your guy’s winter wardrobe. It completes the look, and looks great with anything from sweaters alone, to puffers, to peacoats. Cufflinks – If your guy has to wear a suit to work every day, you know about cufflinks. I love getting fun ones (nothing too crazy), like these skulls, to spice up that boring suit ;). After Shave Balm – Anything from L’Occitane is a great place to start when it comes to guys (or girls!). They have some of the best products, and Chad loves this after shave balm. They also have a ton of great gift packages HERE. Card Case – Chad hates carrying a large (regular sized) wallet around, so I always get him a card case. I love this one from Tom Ford. Classic, the pebbled leather is great, and there is a zipper on the back for change – genius! Gucci Watch – If you really want to splurge on your guy for the holidays, I’m kind of obsessing over this Gucci watch. I love the black face with the nylon band in classic Gucci colors. So good. Chestnut Leather Belt – Every guy needs a great belt for the weekends. This one from Rag & Bone is easily dressed up for date night or down for daytime. Jack Black Grooming – Chad loves anything by Jack Black, so I’m always safe with new bath products. He really loves the face scrub (I love using this too) and the Turbo wash.
Bracelet – Obviously bracelets aren’t for everyone, but a lot of guys can pull them off. I love this one from David Yurman and this one from Monica Vinader. Chunky Knit Beanie – A new beanie is a great gift for any guy who goes to the gym, commutes to work, or does anything outside in winter lol. A winter staple, and if you buy it, you know it will be a cute one ;). Nice Boxers/Briefs – Calvin Klein makes the softest men’s underwear hands-down (I should know I have to fold them all lol). These are a perfect stocking stuffer! Chelsea Boots – I love these boots and they just went on sale! They look sooo good on with a slim jean/pant. Love love love! Noise Cancelling Headphones – One of the best gifts ever b/c every guy (and girl) wants a pair, but nobody wants to buy themselves. These are thheeeeee best headphones! Cologne – My top 3 scents for guys are: Mister Marvelous, Creed Imperial, and Bleu de Chanel. Warm Gloves – I love this pair and the knit/leather combo, but if you guy is a little more casual, this pair looks super warm and comfortable as well! Cozy Hoodie – Not sure about your guys, but Chad loves to lounge when he’s home from work and immediately changes into a cozy hoodie and sweats. This fleece one looks like a dream, and I’d probably end up ordering one for myself ;). Yeti Cooler – I got Kyle one for Father’s Day (with his fav beer inside) and he was so excited. We are big Yeti fans and have a bunch of tumblers and mugs as well! Eye Cream – Kyle appreciates when I try to help in with skin care so I got him this eye cream awhile back. I have to remind him to use it but he’s always happy when he does. Kiehl’s has a ton of amazing products (seriously read the reviews!) that would make gifts. Trucker Hat – Kyle has this and loves it (I actually steal it from him and wear it all the time)! Goorin Brothers hats are super cool (Chad has this one!) and would be a great gift for your guy! Barbour Jacket – Pretty sure Kyle has this jacket in 3 colors lol! He got hooked on them when I worked at Trunk Club. We gave all the guys in our family this coat for Christmas one year and joked it was the year of the Barbour jacket. Seriously though, they are all obsessed with them. Puma Sneakers – These are good sneaks to run around in on the weekends! The white/red/gold is pretty slick! Bose Headphones – I want Kyle to get these so I can steal them from him 😉 I love the color combo and the oversized earcups. It has a built-in mic so you can take calls on them too! Monogram Watch Box – The perfect way to store a watch instead of having them lay all over the dresser, night stands, bathroom counter, etc. Love that you can put a personalized touch on this one. Tie – Kyle wears a suit and tie everyday so he loves getting new ones! The Tie Bar always has the best ones and are reasonably priced. Love this one and this one too! Cedar Balls – These would be a good stocking stuffer! They are cedar balls that absorb odor in gym bags, sock drawers, shoes, etc. Honestly what man doesn’t need those lolll. Duffle Bag – This is a good weekender bag or could even be used for the gym (throw the cedar balls inside lol)! Cufflinks – Perfect for the guy who has to wear a suit everyday. These are classic and look so sharp! Dopp Kit – This is a good sized dopp kit and it’s something a guy wouldn’t usually pick out on his own (but something they need!). I love this camo one too! Barbour Leather Gloves – These have REALLY good reviews and are under $100. Barbour is a great brand and you can’t really go wrong with any of their products. Jack Mason Watch – I love Jack Mason watches! They have so many cool designs/color combos it’s honestly hard to pick a favorite. And the price point is very reasonable for such a nice watch! Adidas Sneakers – These are sick and I’m kind of hoping they come in my size too! Dress Belt – Another item guys tend to not buy themselves so it makes a great present! This one is very simple/will go with everything and is under $100. Gucci Wallet – A splurge but a classic wallet that can be used forever! So many great gifts! My husband is really simple and doesn’t really like stuff so I always have a hard time shopping for him if he doesn’t need something. I did buy him that Hershel travel bag on Meggan’s list for his bday and he loves it and uses all the time.